After Liverpool’s vital 2-1 win at Fulham we have taken a look at the best post-match statistics, including a rare gift from Roberto Firmino to Sadio Mane. The Reds had to battle hard for all three points on Sunday, against an increasingly spirited Fulham outfit. Mane opened the scoring after a well-worked one-two with Firmino, but former Liverpool man Ryan Babel levelled after a mixup between Alisson and Virgil van Dijk. 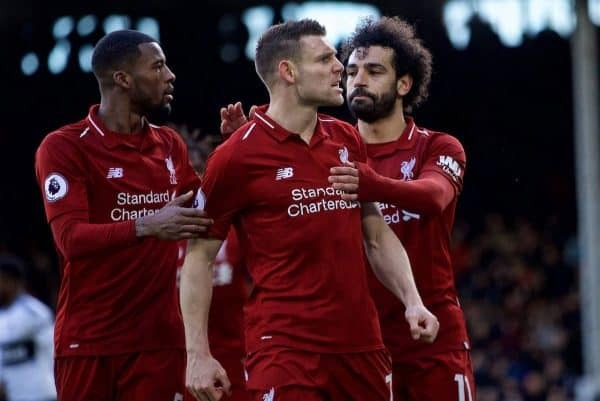 It left James Milner to be the hero at Craven Cottage, stroking home a late penalty after Mane had been brought down by Sergio Rico. The win took Jurgen Klopp‘s side back to the Premier League‘s summit, leapfrogging Man City by two points but having played a game more. Here are the best stats from Liverpool’s crucial victory. City’s continued brilliance is masking what a remarkable Premier League campaign Liverpool are putting together—in many other seasons the title would be all but wrapped up by now. 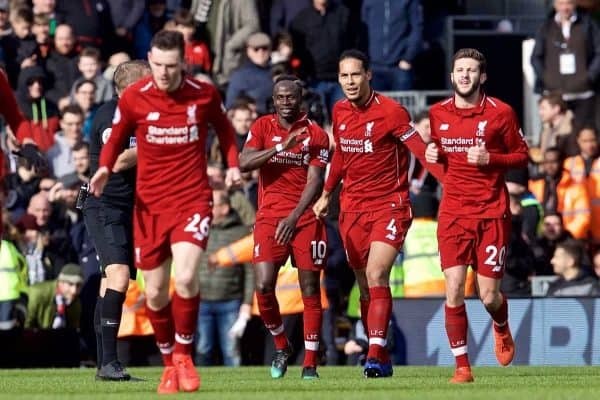 The Reds have now amassed 76 points from 31 matches in 2018/19, at an average of 2.45 points per game. Even more eye-catching is the fact that Liverpool have only collected a greater total four times in an entire Premier League campaign, despite it still only being March. That includes last season, when 75 were acquired on their way to a fourth-placed finish. With 21 points still to play for, it sums up how remarkable the Reds’ form has been since August. Mane’s opening goal at Craven Cottage was typically slick, following a lovely piece of linkup play with Firmino. Surprisingly, that was the first time the Brazilian has assisted his team-mate since the opening weekend of the season. 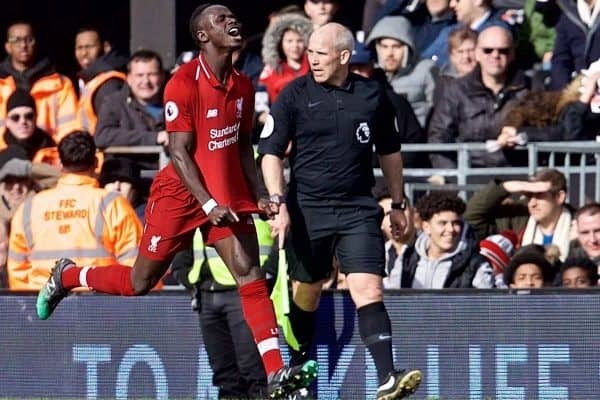 That came against West Ham at Anfield—even then, Mane should have been flagged for offside. 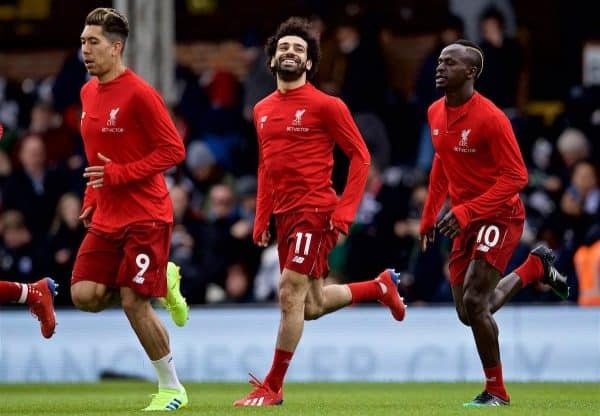 It is arguably a sign of how Liverpool’s much-famed front three haven’t always clicked in the final third this season, particularly in comparison to last year. Mane’s well-taken strike on Sunday took his total to 20 for the campaign in all competitions, putting him level with the currently goal-shy Mohamed Salah. The Senegalese’s growing influence is highlighted by the number of opening goals he has registered in 2018/19 (eight). That is the same number as Sergio Aguero, currently acting as the talisman in City’s title challenge, while Salah has nine to his name. At this rate, Mane could usurp his team-mate on all fronts, as he bagged an 11th strike in as many matches. Van Dijk made a very rare error against the Cottagers after selling Alisson short with a header—just the second time Opta have put a mistake next to his name in 45 Premier League appearances for the Reds. It wasn’t all bad for the Dutchman, however, who continued his superb winning run when captaining Liverpool. 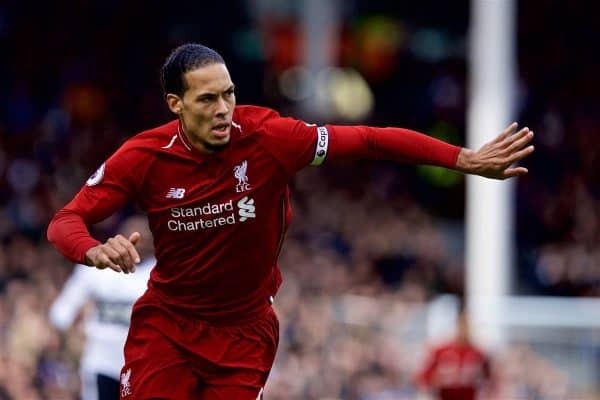 Van Dijk wore the armband in the absence of the injured Jordan Henderson, and Milner’s penalty not only saved his blushes but also made it eight victories out of eight in the role. It seems unlikely that Klopp will be demoting Henderson any time soon, but Van Dijk is showing his leadership in abundance. He surely has to be a future permanent skipper at some point, if Trent Alexander-Arnold doesn’t try and get there first for his boyhood club. Would you prefer any other Liverpool player to be stood over a crucial late penalty than Milner? The 33-year-old is one of the Reds’ most mentally strong players and he stepped up to the plate in his side’s time of need on Sunday. Milner has now converted 13 of his last 14 Premier League penalties, dating back to his time with City, with his only miss coming in a goalless draw against Southampton at Anfield in May 2017. 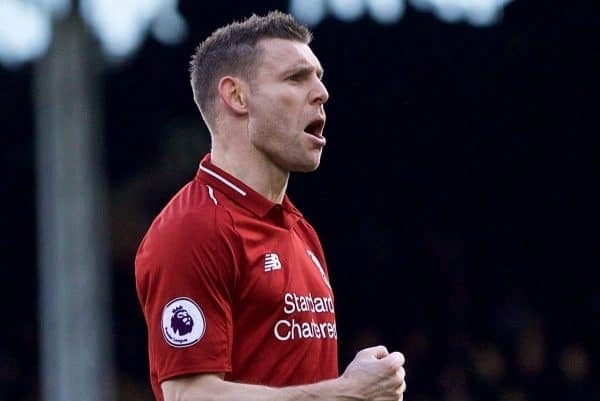 Forget ‘Boring James Milner‘, we prefer ‘Boringly Reliable James Milner‘!